Note: Observe safety precautions. Wear a suitable (chemical cartridge) paint respirator when applying ElectraGuard. Always follow the precautions located on the SDS sheets for any of our liquid products. OVERVIEW OF TYPICAL INSTALLATION: Prior to application, prepare substrate (see details below that are pertinent for your specific type of substrate), pre test bond strength and install ground foil. Day one: Roll first coat of ElectraGuard and allow it to dry. Day two: If you've had to repair the concrete mop down a thin coat of ElectraBond over the first coat of ElectraGuard and allow it to dry (about 2 hours). Roll the 2nd coat of ElectraGuard and allow it to dry. Day Three: Roll optional 3rd coat of ElectraGuard and allow it to fully cure. Day Four: For a high gloss, ultimate wear resistance and ease of maintenance seal the ElectraGuard with 2 thin coats of ElectraThane (applied with a mop) and 1 thin sacrificial coat of ElectraGlaze (applied with a finish mop or wax applicator). NOTE: The typical coverage of the epoxy is about 350 square feet per gallon per coat. Make your life easy! If you have a SMALL area order the product in case lots (4 single gallon containers) or single gallon containers. It is difficult to break down a 5 gallon container and the containers of catalyst into single gallons. Example: A 575 SF area (at 3 coats) would require about 5 gallons of epoxy. You will be applying about 1.6 gallons a day! Our recommendation - ORDER SIX Single Gallons (these would come with 6 premeasured containers of catalyst) and save the hassle and potential problems that measuring may cause. Any remaining product may be used for ESD Bench Tops and other associated items. NOTE: The preparation of the substrate is a critical component of this system and the most time consuming portion of installing the ElectraGuard esd epoxy floor paint system. Take your time and be thorough! To contact us immediately for tech support with this product please call 719 676 3928 (option 2) during our normal business hours of 8 AM to 5 PM Mountain Standard Time. For 24/7 after hours Tech Support please click here. 1) PRODUCT RECEIVING AND STORAGE: Thoroughly inspect containers prior to use. The products are shipped in tamper evident containers that will indicate if they have been opened in transit. Should the seals be broken or the containers damaged contact United immediately prior to installation. IMPORTANT! United makes every effort to ship the correct product however VERIFY the material you have received against your purchase order to United. Contact us immediately should you receive the wrong material. United SCP is not responsible for the installation of the incorrect material, color or dye lot due to errors in fulfilling your order. Store material at ambient temperatures of 60 to 80 degrees Fahrenheit, out of direct sunlight and protected from the elements. The shelf life of the product is 2 years under these storage conditions. 1.1) JOBSITE CONDITIONS: The building MUST be weathertight. Flooring should be installed in the final stage of construction with lighting, HVAC, electricity and running water operating in a fully functional and permanent mode. 2.1) Test the Concrete for Porosity: Prior to full scale use evaluate the concrete for its ability to absorb liquids such as paint. Place a few drops of water on the concrete. If the concrete is semi porous, unsealed and contaminate free it will absorb the water within 10 minutes. If water readily absorbs into the concrete the installation of this product is much easier. Should water not absorb into the concrete the installation of this product is slightly more difficult (see 2.4). 2.2) Bond Strength Testing: Even if your substrate looks perfect its always best to pre-test. Utilizing one of our sample kits (or non-catalyzed, well stirred product from your order), apply 2 coats of the ElectraGuard (wait approximately 1 hour between coats for product to semi harden). For the most representative testing allow this test area to cure for 48 hours prior to conducting the following; with a razor knife etch a 1" x 1" "tic-tac-toe" pattern on the ElectraGuard epoxy. Cover this pattern with standard masking tape, wait 5 minutes and quickly pull masking tape from pattern. Observe the tape. When a good bond is achieved minimal material will be removed with the tape. Remember, the bond strength of this material will continue to improve for about a week. If your test area appears sound and well bonded and the conductivity meets your specifications for electrical conductivity follow the full scale application instructions that follow. 2.3) Porous Concrete (concrete that readily absorbs water): Sweep slab thoroughly using a new, clean, soft broom. If a sweeping compound is required to keep down dust use ONLY an oil free sweeping compound that will not leave a residue. Follow this by thoroughly vacuuming the slab, saw cuts and expansions joints. Damp mop or auto-scrub with ElectraClean and clean cool water changing the mopping solution frequently if using a bucket and ringer or as needed using an auto-scrubber. Allow to dry. Test cleanliness of slab by placing masking tape on several areas of the concrete and quickly removing. Inspect tape for dust. Rub the palm of your hand across the slab. If the slab is dust free proceed to the next relevant step. If the slab is NOT dust free repeat this step. A) DiamaBrush: Concrete prep tool (available for rent at any Home Depot Tool rental center). The preparation with a DiamaBrush looks like this (the dull profile has been DiamaBrush). This prep method is highly recommended. B) Light Diamond Grind: Diamond grind to an SP2 profile (similar to the texture of a phonograph record). Note: United SCP does not recommend shot blasting (sand blasting) as a method appropriate for preparation of the concrete slabs. Important: Grease pens and permanent markers used to mark or draw on the concrete may bleed through the finished coating. Remove these marks with Goof Off or similar prior to application of ElectraGuard. ElectraGuard is not designed to encapsulate the concrete. As such contaminant bleed through is not warranted. The concrete must be structurally sound. ElectraGuard is not warranted nor designed for use over gypsum based underlayments, self levelers, floats nor fills. 2.5) Vapor Emissions from Slab: As this product is microscopically porous vapor emissions tend to migrate through the coating. Although the product has never experienced a vapor related failure our warranty covers emissions up to 8.0 lbs per 1,000 sf / 24 hour period per ASTM F-1869 (Calcium-Chloride) test methods. If your slab emissions have caused flooring failures in the past, if you tape a plastic sheet over the concrete and see visible water beneath the sheet after 24 hours, or suspect emission levels higher than what our warranty provides contact our technical support hotline for recommendations at 719 676 3928 (option 2). 2.6) Removal of Old Flooring Adhesives: Diamond grind, DiamaBrush or scrape prior to installation of ElectraGuard. Not removing the old adhesive will compromise the aesthetics and may shadow thru the finished floor paint. 2.7) Patching and Repairing Concrete: Patch concrete using a Portland based high quality patching compound such as Mapei Plan-Patch or similar. ElectraGuard is not warranted nor designed for use over gypsum based underlayments, self levelers, floats nor fills. To help hide the concrete repair apply one coat ElectraGuard over the repaired concrete and the remainder of the area. When dry, mop on one coat of ElectraBond 20B, allow it to dry and roll on the remaining coats of ElectraGuard. Click here for complete details (call tech support if you do not have web access). 3.1) Preparation of Substrates: Strip floor finish, wax, dirt, oil, grease and other contaminants from the VCT using E Strip. Instructions and product information. Scrub the VCT using the coarsest scrubbing pad available (use new pads only) in combination with ElectraStrip or ElectraClean - auto scrubbing is acceptable. Remove the gloss from the VCT if possible. Insure that all stripping residues have been shopped vacuumed up and the VCT has been double rinsed with cool clean water and a mixture of 4 ounces of ElectraClean to one gallon of water. Allow the floor to dry prior to coating with ElectraGuard. Sanding: For aggressive stains lightly sand the VCT using standard floor sanding equipment and 40 to 80 grit (course) abrasive pad or disk. NOTE: DO NOT SAND VCT TILES MADE PRIOR TO 1999 AS SOME STANDARD TILES AND SHEETS MAY CONTAIN ASBESTOS. Vacuum the substrate to remove abrasive residue. Damp mop with ElectraClean and double rinse the substrate prior to application of ElectraGuard. 3.2) Always Bond Strength Test: See 2.2 (application details above) and approve results prior to proceeding. CONTINUE TO 6) ALL SUBSTRATES (as follows). Note: It's always best to apply ElectraGuard to a paint free surface however many customers successfully bond ElectraGuard to existing well bonded floor paints. ALWAYS pretest for compatibility and bond strength prior to full scale application. 4.1) Preparation of Substrates: Strip floor finish, wax, dirt, oil, grease and other contaminants from existing paint using E Strip. Instructions and product information. Lightly sand substrate using standard floor sanding equipment and 40 to 80 grit (course) abrasive pad or disk. Insure that all loose paint is removed. Damp mop or auto-scrub with ElectraClean and clean cool water changing the mopping solution frequently if using a bucket and ringer or as needed using an auto-scrubber. Allow to dry. Test the cleanliness of the substrate by placing masking tape on several areas and removing. Inspect the tape for dust. Rub the palm of your hand across the slab. If the slab is dust free proceed to the next step. If the slab is NOT dust free repeat the cleaning process. 4.2) Always Bond Strength Test: See 2.2 (application details above) and approve results prior to proceeding. Please Note: When testing over paint insure that ElectraGuard does not remove the existing paint. Occasionally when ElectraGuard is applied over inexpensive latex based floor paints the existing paint may peel, bubble and soften. Concentrate your compatibility review over areas (if any) where the existing paint has chipped or been removed due to wear (non-compatibility is exasperated at these interfaces). If your test area appears sound and well bonded, the conductivity meets your specifications for electrical conductivity and ElectraGuard is compatible with the existing paint follow the full scale application instructions as follows. 5.1) Preparation of Substrates: All metal surfaces must be free of contaminants that may interfere with the bond strength of the ElectraGuard Epoxy. Remove all welding flux residues, degrease substrate with common degreasers or steam cleaning if needed. Allow the subfloor to dry thoroughly. Sand the profile using new clean and course 60 to 80 grit aluminum oxide sanding disk or otherwise prepare the surface to replicate that of about a 280 grit piece of sand paper. This slight profile enhances the bond strength of the ElectraGuard and removes oxide layers from aluminum. ElectraGuard is NOT designed to protect a steel substrates from rusting. Should this be a requirement clients have reported good results using Corotech V142-20 shop primer (be sure to follow the directions for application and preparation if using this product). Corotech is electrically insulative. The static conductive ElectraGuard Epoxy floor paint will thus NOT be able to ground through the steel subfloor without assistance. As such, run a bolt thru the top surface of the ElectraGuard and into the steel in all four corners of the structure. Contact United if further details are needed. Remove dust residues by thoroughly sweeping using a soft broom and an oil free sweeping compound such as Oil-Dry Green Sweeping Compound part number L91050-G90. Shop vac cracks, crevices, corners and subfloor to remove all traces of dust and sweeping compound. ElectraGuard is self priming but the subfloor should be coated immediately after preparation to minimize reintroducing rust and oxide layers that may interfere with successful bonding of the ElectraGuard. 5.2) Always Bond Strength Test: See 2.2 (application details above) and approve results prior to proceeding. NOTES: ElectraGuard is NOT designed to inhibit steel from rusting. Steel and aluminum subfloors do not require the addition of ground straps if the subfloor is grounded and no primers have been utilized. 6) Apply ground foil tape to substrate prior to coating with ElectraGuard. Please Click HERE for Details. The ElectraGuard system only requires 2 ground connections for small floors (under 3,000 sf) and one additional ground for every 4,000 sf thereafter. More grounding attachments will not raise the conductivity of your flooring system. Each ground point only requires about 5-10 minutes to install and does not normally require an electrician. 7) MASK ENCUMBRANCES: Mask encumbrances such as walls, wall base, equipment, etc. using high quality standard blue painters tape. 8) APPLICATION OF ELECTRAGUARD: Catalyzed ElectraGuard should be used within six hours of mixing, therefore prepare only the quantity necessary for immediate use. Add the pre-measured catalyst to epoxy base. Stir gently using a low speed drill with a rotary paint mixing attachment until the catalyst has been thoroughly mixed into the base and the pigments have been well blended into the mixture. No solids should remain on the sides nor bottom of the pail and the mixture should look creamy with no clumps. Allow this catalyzed mixture to stand 5 minutes. Pour into the appropriate size paint tray. Note: United SCP recommends using a high quality 18", 3/8 nap roller for application of ElectraGuard. Apply the first coat of the catalyzed material in a thin uniform coating pattern as follows. In most cases start in a corner of the area. Trim the corner and about 5 feet along the walls with a 4" line roller. Taper this application (thick towards the walls and very light on the side facing you). Immediately roll into this trim with the larger paint roller. Dip the large roller in the tray, roll on tray top until the roller is evenly coated and not sloppy wet. Start back about 4 feet from the trim and evenly roll a coat into the trim and back onto the floor towards you. When the large roller is low on paint repeat the process. Always apply the paint back about 3 feet from where you left off and roll into the wet paint (where you left off) and back towards you. Avoid thick edges and let the roller do the work (no need to press the paint roller). When you look at the area under good lighting follow the gloss! The coating should be even, thin and contain a minimum of roller marks while covering the concrete 100%. Most clients have the best luck applying sections about 5' long at a time. Trim as you go and avoid splatters and drips. Take your time - roll smoothly my friend! Note: Wet paint rollers and roller assemblies not exhibiting wear may be stored overnight in airtight clean trash bags and reused the next day. Allow 1st coat to cure and dry for 8 to 24 hours. NOTE: curing time dependent on air movement and ambient temperature in facility. Lightly scrape cured 1st coat to remove any paint splatters or minor imperfections if needed. Application using a paint sprayer: ElectraGuard is normally applied with paint rollers but may also be applied using an airless paint sprayer with a 10" to 12" fan pattern spray tip, an .021 to .023 inch orifice and a 30 to 50 mesh filter. Strain paint prior to adding it to the airless. Use of an extension pole can help to reduce over-spray. Apply a thin uniform coat making sure to move at a constant rate. The product may be back rolled if needed using a high quality 3/8 nap roller. Expect the first coat of ElectraGuard to look patchy and thin. Should your first coat not cover concrete imperfections created from concrete repair: Mop on 1 coat minimum, 2 coats maximum of ElectraBond Intermediate Barrier Coat. Apply thin even coats using a finish mop or wax applicator. Allow ElectraBond to dry for 2 hours prior to proceeding to the next step. Apply a second thin even coat of catalyzed ElectraGuard using a 3/8 nap high quality paint roller. Allow to cure for 12 to 24 hours (curing time dependent on air movement, humidity and ambient temperature in the facility). If needed, lightly scrape the coating the next day to remove paint splatters and minor imperfections. An application of a third coat of ElectraGuard will provide optimum esthetics and durability. 9) COVERAGE AND DAILY YIELD: The initial coat will cover approximately 250 to 400 sf per gallon. Allow the initial coat to dry and apply a second coat. Second coat coverage is approximately 300 to 400 sf per gallon. Application of second coat is much faster. A third coat will provide optimum esthetics. Finished floors may be opened to light traffic, under normal curing conditions, after 12 hours. Complete curing with maximum durability, chemical resistance and electrical conductivity will take 5-7 days or longer (the curing time is dependent on the air flow, ambient temperature and rH in the facility). The average daily yield is about 5,000 to 10,000 sf per person per day. 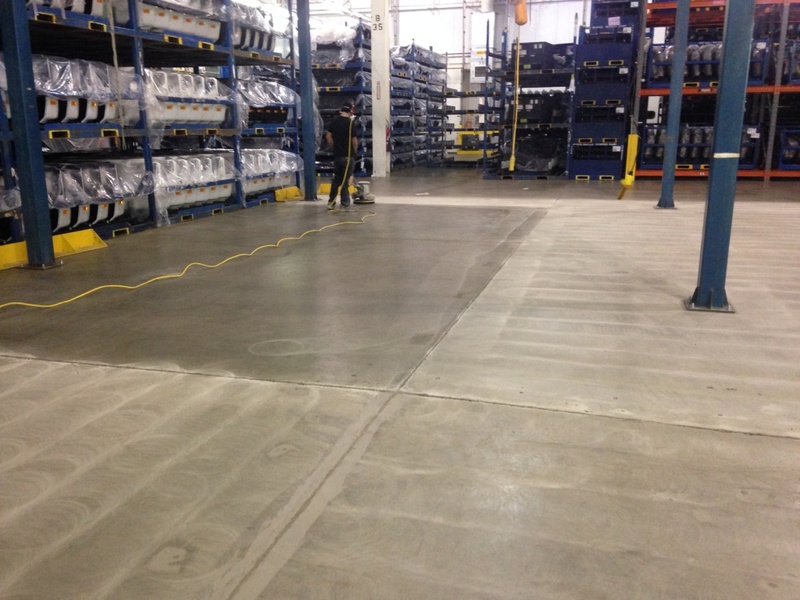 Your ElectraGuard ESD Epoxy floor may be sealed for ultimate shine and scuff resistance. As applied, coatings of ElectraGuard provide optimum conductivity and a matte type (low glare) finish. Optimum wear performance, scuff resistance and high gloss is achieved via a topical application of 2 thin coats of ElectraThane followed by 1 thin (sacrificial coat) of ElectraGlaze. Sealers slightly raise the insulative properties of ElectraGuard hence, use them sparingly and apply in thin even coats using a finish mop or a wax applicator. 11) ElectraThane and ElectraGlaze application instructions: Thoroughly remove loose dirt and dust from cured ElectraGuard via sweeping (do not use sweeping compounds), vacuum as needed. Agitate the sealers in their containers prior to use, pour into clean contaminant free bucket and mop on thin even coats using non linting synthetic finish mops. Allow the sealers to dry (depending on humidity and temperature) for at least 90 minutes before application of next coat. NOTES: Chair casters can act as tiny ball mills and may damage all hard surface esd floors including tile, thick set epoxy, rubber and ElectraGuard. Our HSSB esd floor mats may be used should chair caster wear become an issue. ElectraGuard ESD Epoxy Floor Coating has a lower odor than any other epoxy coating on the market but adequate ventilation is desirable. If opening bay doors for ventilation be sure to not allow windblown dust to contaminate the wet epoxy. Ultimate slip resistance may be achieved by broadcasting fine Aluminum Oxide sand blast grit to wet ElectraGuard. Use latex painters gloves during application for easy cleanup. ElectraGuard may be installed by any competent painting contractor, by the end user or by United Installation Services. ElectraGuard Flooring is a thin set epoxy applied using paint rollers. As such, slight deviations in thickness, texture, color and shading may be present in the final installation. Dye Lots may vary. For best results place your order for the entire amount needed for the current project plus possible future expansions. The shelf life of the product is 2 years as long as it is stored in a cool dry climate and in unopened containers. ElectraGuard as applied does not have a shine. It is a low glare matte finish. For a high shine finish, top coat with the ElectraGuard High Gloss Sealers. ElectraGuard In its unsealed or slightly sealed form normally meets DoD 4145.26-M, NFPA-484-18 and many other standards used in the manufacturing of energetics and with fine particles. Always pretest to insure ElectraGuard will meet the standards prior to full scale application. Note: When this product will be used for compliance to DoD4145.26-M / DA PAM APPENDIX C-1. standards always pretest conductivity with the heel grounders or conductive shoes that are normally used at your facility prior to full scale approval and application. For these applications lightly applied sealers may be used to tailor resistance ranges for the specific operational AC voltage used at your facility (the sealers increase the floor's insulative properties). Excessive concrete vapor emissions may render the minimum resistance requirement unachievable.